Camel spiders in the gulf-Truth! - Truth or Fiction? Camel Spiders in the Gulf-Truth! But It’s a Close-up! 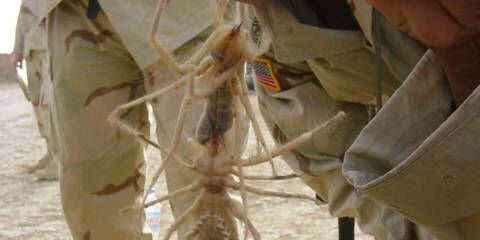 Photo of a gigantic spider allegedly caught by military members serving in Iraq. We haven’t tracked down exactly who took this picture or when and where, but the chances are good that it’s authentic. Camel spiders are real, are large, and are in the Middle East including Iraq. They don’t get as big as a man’s leg, however, as appears in this picture. The photo, if authentic, was taken at close range as is indicated by the hand and cuff of the soldier that are visible in the upper right. Also, it appears to be a picture of two spiders. 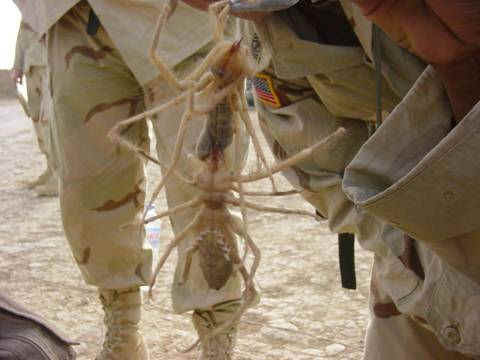 Some pictures of camel spiders first came from soldiers headed for Iraq but who encountered them in Kuwait. There are some urban legends about camel spiders that claim they scream when they run, that they can run as fast as 25 miles-per-hour, and that they climb onto the undersides of camels and eat their stomachs. According to the experts we’ve consulted, they do not make any noise, they do run very fast but not 25 miles-per-hour, they are primarily nocturnal, they do not eat camel stomachs, and their bite can sting or produce numbness, but is not lethal.